Campingplass Orchidea er en campingplass i Feriolo, Verbano-Cusio-Ossola, som ligger ved innsjø/vann. Denne terrassecampingplassen har steder med avgrensning, med skygge og plasser med noe skygge. Camping Orchidea ligger i nærheten av en sandstrand. Det er mulig å leie stasjonære campingvogner og leiligheter. Campingplassen har lekeplass og idrettsplass. For sportslige feriegjester arrangerer campingplassen utflukter og ulike sykkelturer. Det er underholdningsprogram. Campingplassen har utendørs svømmebasseng. I nærheten av campingplassen kan man svømme i en innsjø/vann. Ved Camping Orchidea kan man drive med vindsurfing og vannskikjøring. Det er ikke alltid nødvendig å lage mat selv, for på campingplassen er det snackbar, pizzeria og restaurant (begrenset meny). På campingplassen kan man også kjøpe nybakt brød. Det er mulig å bruke internett, for campingplassen har én eller flere computere med internettilkobling og på 80% av campingplassen kan man få tilgang til internett med egen laptop. Denne inspektøren besøker hvert år Campingplass Orchidea og inspiserer campingplassen for ca. 200 fasiliteter og for andre punkt som forekommer. Inspektøren er en medarbeider fra ACSI og arbeider ikke for campingplassen. A fairly large lakeside campsite. We were lucky and managed to get a lakeside pitch on the edge of the site which overlooked the lake on one side and a small creek on the other – perfect! Pretty and peaceful. But if it is busy and you are unfortunate you could be crammed into the centre with no view and, in some places, rather dark under the trees. The view from our pitch was lovely and we enjoyed many hours watching the bird life going about its daily routines. The only downside was we overlooked the campsite 'beach' and were subjected one evening (fortunately just one!) to a long bout of loud shouting and screaming from some boys playing in the lake. The facilities were basic but clean. The campsite has a small shop with a reasonable selection of stuff. Also has a restaurant but we didn't use it so can’t comment. WiFi is charged as extra. After cycling along the busy road to the nearby village of Feriolo, the next evening we discovered we could walk/cycle directly from the campsite via a new gate which looked like it had been recently opened. And just outside the gate there is a stall selling great ice-creams! A lovely site next to the lake and within walking distance of the town.A beach for children, great bars and eating places both on site and locally. We will be going back very soon. This is a great site and in a great location, we stayed here for 3 weeks, 1 week finding our surroundings and 2 weeks with family visiting in Baveno. Right on the lake, good size pitches, quiet site, good restaurant, mixed reception staff (younger lady very helpful, older lady very grumpy). Town of Feriolo is right outside gate with some very good restaurants and coffee/cake places. You can cycle to Baveno which has a ferry terminal to all the great places to visit - the 3 islands, Stresa, Verbania and Locarno (Switzerland). You can also cycle to Stresa not cycle route all the way however motorists seem to be courteous. Sanitary Facilities are kept clean and tidy. Downside have to pay for wifi. ACSI visitors have to pay cash regardless of length of stay. Recommended. We loved this site and found it an excellent choice. It was on the edge of the lake and had lovely views over the water to the towns and hills around. In the evening though the views were magical with lights twinkling and reflecting over the water from dusk to dark. The pitches were a good size, mostly gravel and part sun part shade. There were three grades of pitch, 16 euros for standard at the back of the site, 18 euros for nearer the lake and 20 euros for front row lakeside pitches. The site has a bar and restaurant which, although we didn’t try it, was always busy during our stay, a good recommendation in itself. They also sold take away pizzas which we did try and found excellent. The village of Feriolo di Baveno is just outside the gates with further restaurants along the waterfront as well as boat trips on the lake. The site is child friendly with quiet and safe roads, a small playground for younger children and a lovely private sandy beach. Dogs were not allowed on the campsite beach but we were able to walk our dog on the public beaches near the site. The reception was mixed. The first girl was very friendly but the next one made us wait while she finished her photocopying! Both were efficient though and able to help with our enquiry. The toilets and showers were plentiful and clean but like a lot of Italian sites, no loo seats or toilet roll provided. There were good dishwashing, washing machine and ironing facilities. The site seems very popular with both Germans and English. We stayed two nights and had to pay in cash when we left. Very nice campsite. Quiet, very large emplacements, shadowed, spectacular surroundings, close to Feriolo, a very nice village. Bathing in Lago Maggiore is a superb experience. One of the best campings I've been to. Vil du booke campingplassen Campingplass Orchidea eller få mer informasjon? Det går bra med opplysningene nedenfor eller via campingplassens nettsted. 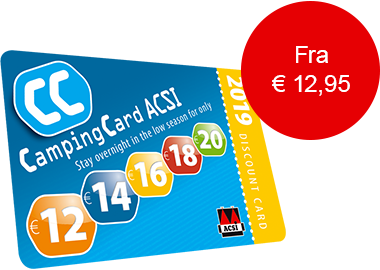 ACSI Eurocampings sender din forespørsel til "Campingplass Orchidea".